The construction of the two Horseley ironworks bridges at Braunston Junction came about when the Oxford Canal Company, realising that their northern section was far too circuitous to compete with other newer, more direct canal routes, straightened their line from Hawksbury to the abandoned village of Wolfhampcote near Braunston. 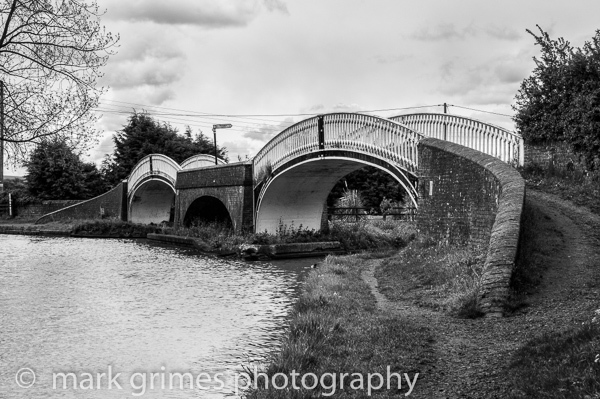 The new route was nearly 15 miles shorter than the old line and encompassed many changes, one being the moving of the junction between the Oxford Canal and the then named Grand Junction Canal, the original is now part of Braunston Marina some 600 yards south of the bridges. This view is looking south from the Northern Oxford Canal with, what is now the Grand Union Canal passing under the Bridges to the right. This entry was posted in Canals by admin. Bookmark the permalink. Genius . . . is the capacity to see ten things where the ordinary man sees one–Ezra Pound. This picture reveals the timeless truth that photographic composition is something one is born with; It simply cannot be learnt. If inanimate structures were able to pose, if nature could be commanded to yield to the photographer’s vision, then this is the sort of image one might expect. Of all the scenes I have surveyed on your site, this is a real world classic, photography art par excellence. Whilst the inherent minimal nature of the bridges is easy to appreciate, you have managed to create a visual duality, whereby these twin structures exist in simultaneous dimensions, both as simple functional entities and as phantasmagorical creations. The ability to cater for the purist, who demands an honest representation of the landscape, as well as the artistic sentiments of the more refined critic, is a truly exceptional feat. A friend who has an interest in special effects suggested that the real attraction of this picture lies in its creative tension and delightful ambiguity. He speculated that the photographer had been caught in an existential dilemma that had hurled him into the outer reaches of his artistic galaxy. Albert Camus, he explained, had written in his celebrated novel ‘Nausea’ that, “man turns up, appears on the scene, and only afterwards defines himself”. This picture, he believed, was a metaphor for Camus’ observation, in that the photographer has turned up, captured a scene, which had later come to define his very being. His closing remark was particularly revealing: “What we see here is an epiphany-the the transformation of a technically proficient photography enthusiast into a dream weaver and visual artist.” Given the impact of this particular portrait, it would be foolish to argue with such a contention. The surreal and natural look of this image is an absolute joy to behold! Birth of a genius? I was going to reserve judgement, but I won’t. A resounding yes, yes, yes! There is a fairytale quality to this picture; one could easily imagine a troll on either bridge, and I was reminded of two powerful stories; the children’s classic ‘Three Billy Goats Gruff’, and Terry Pratchetts ‘Troll Bridge’ fable, which is currently in production. Here we find the protagonist, Cohen the Barbarian, on a journey to Death Bridge for a fateful encounter with a hideous troll. I allowed my imagination to run wild, and it was easy to see Pratchett’s vision played out through your wonderfully evocative talent. There is an eerie finality in your composition, signalling that something awesome and deadly is about to happen. It’s as though the soft tones, tranquillity and overall clarity of the visual sculpture disguise an altogether different reality: the drama and sense of foreboding is really quite breathtaking. Directly above the middle section of the second bridge, the cloud formation lends itself to the appearance of a sinister face; coincidence no doubt, but it adds an extra dimension to the landscape… perhaps Fortuna, having spotted a great talent, had beseeched Mother Nature to contribute a little something to this remarkable composition. Another triumph from a brilliant photographer.